Below you will find common questions and answers related to Forex Diamond EA. 3. What type of trading software should I use to work with Forex Diamond? 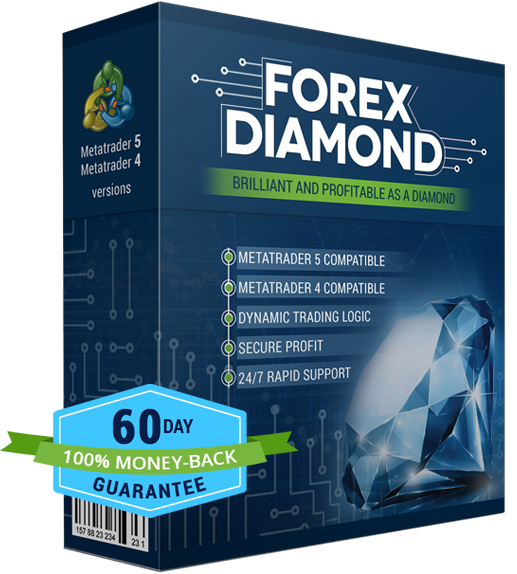 Forex Diamond can work with all Metatrader4 (MT4) and Metatrader5 (MT5) forex trading platforms. MT4/MT5 can be found and downloaded from most brokers' websites. It is free. Yes it is easy to use. Forex Diamond is based on a new generation technology that allows you with a few clicks to install, run and start earning money. No need to be professional. Everyone can do it. It is completely hands free and the whole process is 100% automated. 5. How can I install Forex Diamond? Is it easy? Yes it is too easy. Just a few steps and you will be ready to use Forex Diamond. You can download detailed installation guide from the download section in the member area. It will guide you through the setup process. 6. How can I activate my Forex Diamond? Your copy of Forex Diamond should be activated for your real and demo accounts trough our website. You should login into your Account: http://www.forex-diamond.com/activation and then find the account activation window. Type your account number in the field and click “Activate”. Repeat this procedure for all accounts. 7. Can Forex Diamond work when I am away? Yes Forex Diamond can work 24 hours per day from the market opening on Monday to the market closing on Friday. You don't need to monitor you trades. Our EA will do it for you. It will monitor the trades, open and close positions automatically. 8. Where can I download MT4 (Metatrader 4) and MT5 (Metatrader 5) trading platform? MT4/MT5 is a free trading platform. You can download it from the official web sites of your broker. Here is the list of most popular brokers: FXCM, FXDD, Alpari NZ, Alpari UK, IBFX, FXOpen, FXPro. First you need a computer with a minimal hardware configuration and a stable internet connection. Second you need to install Metatrader 4 or Metatrader 5 trading platform. You don't need to have any additional Forex knowledge because our Forex Diamond includes detailed User Guide & Installation Manual. 10. Can I use Forex Diamond with any broker? You can use any broker that offers the Metatrader 4/Metatrader 5 trading platform. 11. Should I trade myself when I use Forex Diamond? You don't need to trade yourself. Just turn on Forex Diamond and let it trade using your account to bring some profit for you. Of course you can trade manually too. But we recommend that you use only Forex Diamond to avoid any lost. Yes we offer free updates of our robot. Our development team will not stop improving of the Forex Diamond and make it competitive on the market under actual market conditions. 14. I don't have much money. What is the minimum amount needed to start trading? We know that the money are the main question. We know well that many people don't have much money to get started. Our robot is made to be able to trade with a minimum amount of money. The minimum amount depends to your brokerage company too. You can start trading with a small amount as $100-$500. But don't forget the fact that trading with a small amount may be disadvantage because you will only be able to trade the market in small sizes. The recommended capital is $1,000-$5,000 of course you can test it with Demo account first. Yes it is possible. Forex Diamond will not touch any other trades. 16. What timeframe is recommended to use with Forex Diamond? Forex Diamond is designed to work on M15 time frame. Yes we provide customer support. Our support team is working 24/7 for you. If you have any questions about our robot or about our website don't hesitate to contact us. 18. Can I use Forex Diamond on other currency pairs? Yes you can use but Forex Diamond is designed to work on currency pairs GBP/USD, EUR/USD, USD/CHF and USD/JPY (M15 chart)! 19. I cannot open the User Guide. What should I do? 20. What is best at the beginning - Demo or Real account? 21. Can I use Forex Diamond on a demo account until I feel comfortable trading on a live account? Yes you can. You can use Forex Diamond and switch between demo and live trading at any time you wish. 22. What kind of internet connection and computer hardware do I need? 23. Should I turn off Forex Diamond on weekends? You don't need to do that. The market is closed on weekends and the Forex Diamond will sleep until Monday. 24. What will happen if I lose internet connectivity for a short time? 25. What will happen if my computer loses power or reboots? You shouldn't worry about that. The trades that are currently open will stay open until the computers power is restored, no new trades will open at this time and the system will resume normal trading as soon as the power is restored. Just start your computer, run the Metatrader again and be sure that your Forex Diamond Expert Advisor is turned on. It will continue trading. 26. Is Forex Diamond EA compatible with Metatrader 5? Yes, it is. It is compatible with Metatrader 5 (MT5) and you can use it without any problems. 27. Is Forex Diamond EA compatible with MAC OS? Yes, it is. Forex Diamond EA can be used on any Mac OS.